Is Social the New [STAFFING] Cold Call? Is Social the New Cold Call? Since just about the dawn of time, staffing firms have sold by cold calling. But it's time for a better approach! With social media (and inbound marketing), you can generate significantly more sales leads with significantly less effort than smiling and dialing. And it won't burn your sales reps out! So how do you cold call with social media? Our Social Media Marketing Advisors put together 20 lessons we learned through testing and analyzing social marketing data. These are real-world examples specific to the staffing and recruiting industry! 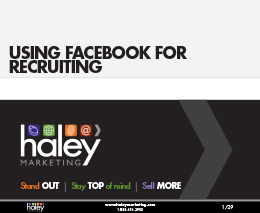 As a special BONUS to this month's Idea Club on social media, our team has put together an awesome new eBook on using Facebook for recruiting. If you need more job candidates, this 29-page guide will teach you everything you need to know to unlock the recruiting power of the world's biggest social network. I hope you enjoy this month's feature article and our Facebook recruiting eBook. If you have questions--or if you want to chat about specific sales or recruiting ideas for your company, please email us at [email protected]. Can you imagine a sales rep that only costs $7,200 per year?! Well it's possible when you use our content marketing program, HaleyMail. HaleyMail will help keep you top of mind, position you as an expert, and give you tons of content to use not only in your monthly newsletter, but also on all your social media platforms. And the best part is, for the remainder of the year, we are waiving the startup fee! Contact Todd Lewandowski at [email protected] to find out more about this great offer. We Increased The Frequency of Blog Posting and Check Out What Happened To Our Inbound Leads!